Flashes and floaters are very common. Almost everyone experiences them at one time or another. They become more frequent as we age. In rare cases, a doctor's exam may reveal a more serious problem called a retinal tear or retinal hole. Because of this, it is important to have your eyes examined on a regular basis and always inform your doctor if you're experiencing flashes or floaters. Flashes of light are caused by tension between the vitreous gel in the eye and the retina. As the gel pulls on the retina, the retina is stimulated, sending signals to the brain that are interpreted as flashes of light. As a person ages, the vitreous gel liquefies and separates from the surface of the retina. Imperfections in the gel may cast shadows on the retina that appear as fine dots, strands and strings in one’s vision. 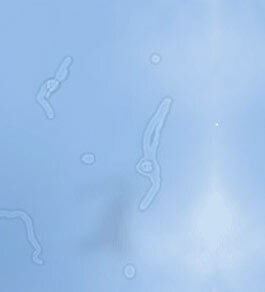 Since these imperfections often take on a floating appearance, they are called floaters.